Valentine’s Day is fast approaching and this year we have the most amazing package that your special one will absolutely love! An amazing cheese platter by us here at Sharp + Co, paired with sweets from the talented patissier Stacey, from A Sweet Ride Called Clyde, and stunning blooms from the team behind A Beautiful Occasion. For just $100 + GST, you can choose a small cheese platter or a small sweet platter box and bunch of blooms, or really impress that someone special by ordering all three for $150 + GST. Delivery charges may apply, depending on the area. This one is not to be missed with local businesses we love. We live for love like this. From the moment we arrived to create a 3 metre graze for a beautiful couple, their friends and family on their private property at One Mile Beach, oh boy could we feel the love. They said I do on their block of land where their dream home and marriage will live, amongst the trees and that cool ocean breeze, in a tee pee that made for a bohemian, fairy lit wedding bliss wonderland. Everyone came, loved, celebrated and grazed to the early hours of Sunday. What is not to love about that? We would love to be apart of your blissful moments. And working alongside other vendors we also love A Beautiful Occasion Beavis Hire + The Tipsy Camper. Contact us at hello@sharpandcoplatters.com so that we can create a graze for you and your loved ones. We have just been featured in the Newcastle Herald where we talk about us and why food. We are two sisters who have recently returned to the Hunter and our love of food. 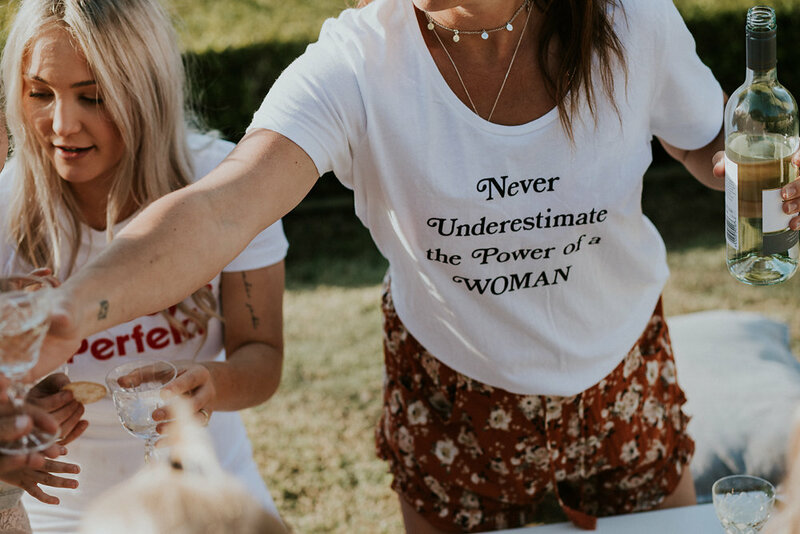 Having worked away in the corporate world, on our fashion label Matters Speaking + travelling, we wanted to connect with the community and create something we are so passionate about. We believe that life is about creating memories with people you love, and we like to do that with food. We have completely different skill sets but believe we do life and business better together. Laura has completed a degree in in Tourism and Event Management during which she worked at the Newcastle Knights and has years of quality and document control experience, and Jess has completed a traineeship in Hospitality Management at the Shoal Bay Country Club before being the creative and marketing drive behind Matters Speaking which was stocked in over 60 retail outlets in Australia and overseas , as well as being featured in Vogue. We have combined our experience, and life long love of food to create Sharp + Co to share in Newcastle, Port Stephens and the Hunter Valley. For more things about us and our love you can read our full feature in the Newcastle Herald here. Since launching Sharp + Co this year, we have had the opportunity to meet, create and work with, the best in the business. Sarah and Amy from A Beautiful Occasion have not only encouraged us, but supported and recommended us , since the moment we began. And it means the world to us, as we love nothing more that women supporting each other in life, love and business. 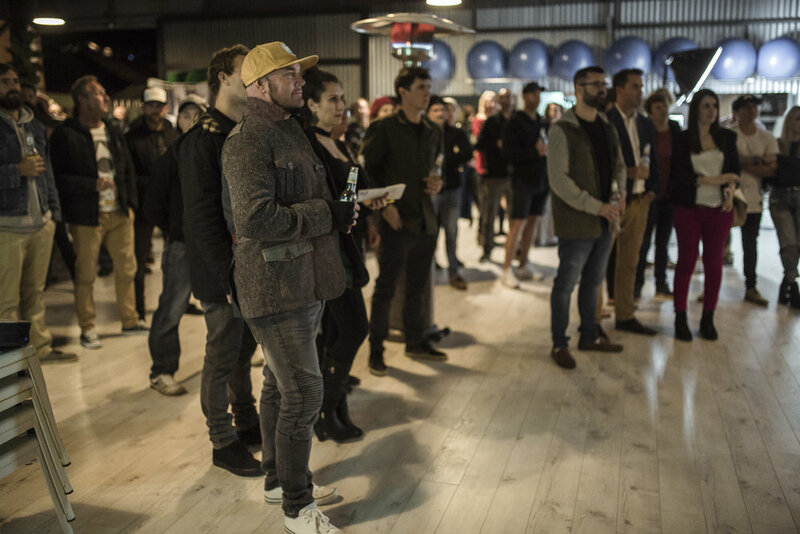 They work with so many incredible local vendors such as The Anchorage, Bannisters and Broughtons on the Bay, so for them to have chosen us to cater for their Christmas and end of year celebrations for themselves and their team, meant the world to us. Here is the beautiful graze we created for these beautiful women. A blissful morning graze on Shoal Bay Beach we created to celebrate lovers Jen and Riley Bliss marriage, with Muse Photography and White Roses Styling. It reminded us that loving who you love, and what you do, is everything. Contact us at hello@sharpandcoplatters.com so that we can create a graze you will always remember with the people you love the most. This one was for a beautiful bride + groom, Ryan and Kayla. 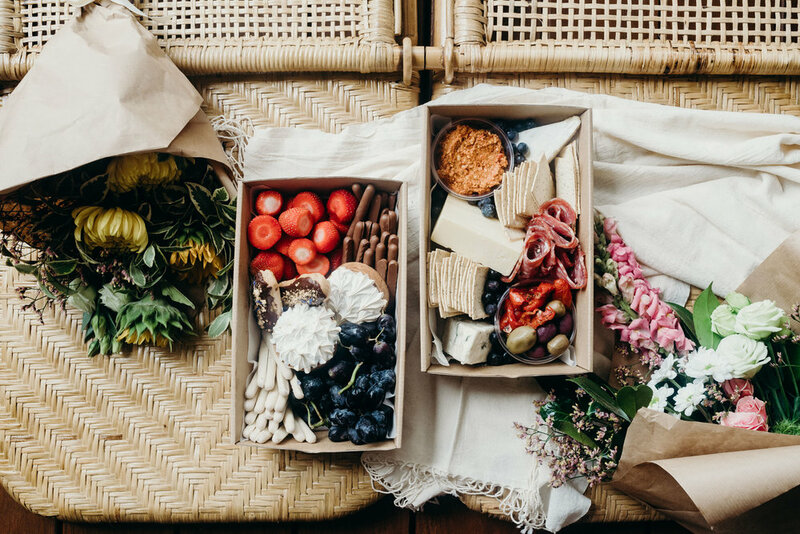 A flat lay graze of artisan cheeses, antipasto and savoury accompaniments including a selection of dips, olives, sun-dried tomatoes, cured meats, nuts, fresh and dried fruit, styled with gum from Newcastle Flower Markets. Because all you need is love + cheese. Contact us at hello@sharpandcoplatters.com for all your cheese grazes. When you are asked by Pauline Morrisey, lover of things beautiful, and writer for Domain, Sitchu and Real Living Magazine, to create a beautiful graze for her greatest loves birthday, you travel to Sydney and do exactly that. We created an artisan graze for her husband Kieran’s 30th birthday including a selection of canapés including smoked salmon, creme fraiche and dill blinis, roast beef, rocket and horseradish cream crostini’s, vietnamese banh ma baguettes, prosciutto, basil and balsamic crostini’s, along side a bar from Timber Mill Rentals, under their festoon and moon light, in their Glebe terrace court yard for a night filled with just beauty, love and friendship. 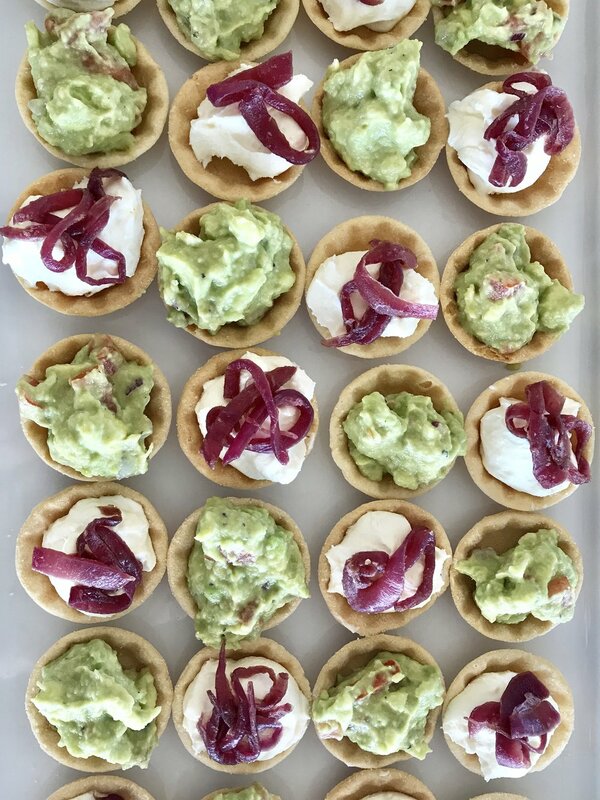 Contact us at hello@sharpandcoplatters.com for your next event. Fresh air, good food and great people. A graze we did in Stroud for a 60th birthday celebration, on a private property in the country in a couple’s barn. As they celebrated with their family, children, grandchildren and friends. It reminded us why we began. For the love of family and our love of food, to create memories like this. Florals from Newcastle Flower Market. Beauty and colour is all around. We cannot get enough of the graze we did for the beautiful team at Enigma Hair + Body and the opening of their new space at Honeysuckle. Contact them for all your beauty needs and us at hello@sharpandcoplatters.com to cater for all your beautiful occasions. We are beyond passionate about what we do but what we love most about food, is how it brings people together. Our favourite memories growing up and moments today is spent with people we love the most, eating and drinking. Not only does Sharp + Co allow us to do this for others but it also introduces us to the most beautiful people and families. There wasn't a dry eye at Broughton's On The Bay when Loz and Milo said I do and it reminded us that rain, hail or shine, love is all that matters and will remain. Thank you also to A Beautiful Occasion for making this wedding and our grazing tables even more beautiful. Contact us a hello@sharpandcoplatters.com for your next beautiful occasion. 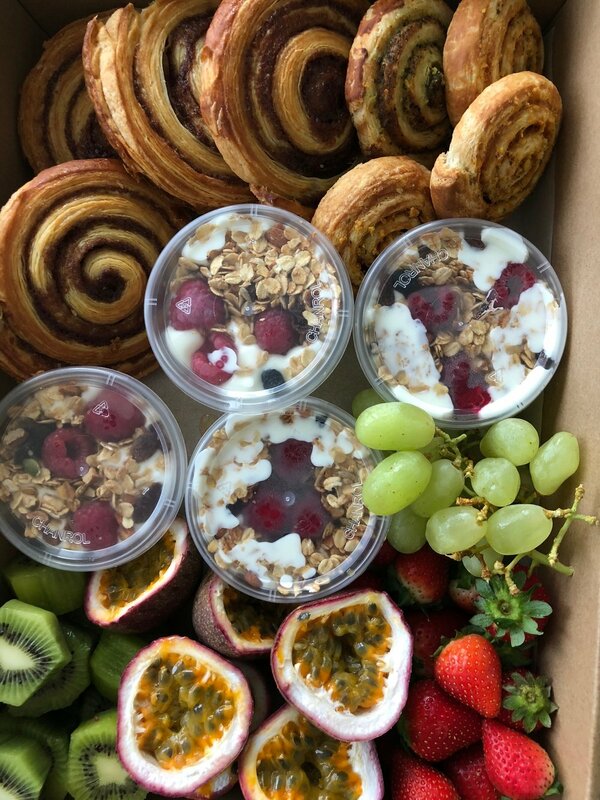 We now offer breakfast platter boxes. Available with freshly baked pastries, yoghurt, muesli + berries and seasonal fruits. Perfect for corporate functions, mornings for every occasion including weddings and breakfast in bed for two. Contact us at hello@sharpandcoplatters.com to order yours. 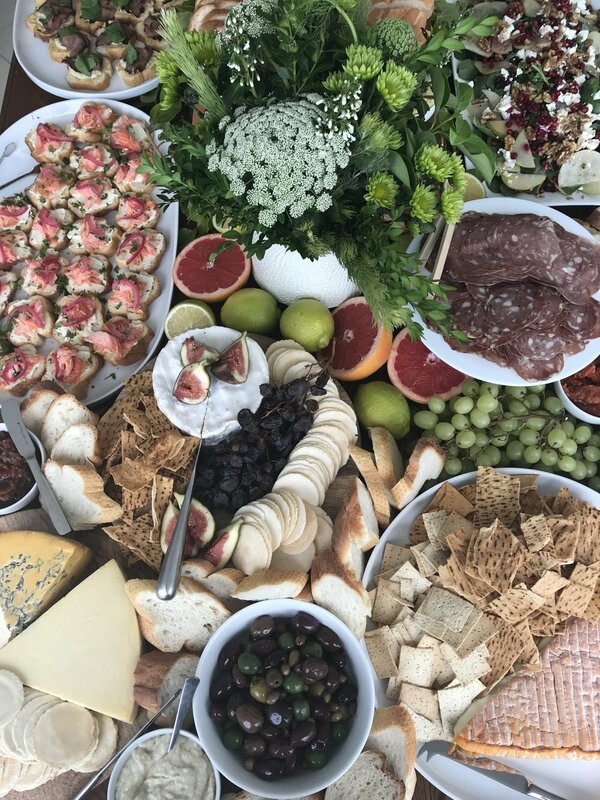 We recently were asked to provide a selection of platter boxes for Port Stephens Women in Business event at Addison Partners including a selection of cheese, fruit, sweet and savoury boxes made freshly from our kitchen and delivered straight to the event. Because women who support women, are our kind of women, and we love to cater for all your corporate and special occasions. We recently had the pleasure of doing a grazing table of what bohemian dreams are made of to celebrate a couple with old souls, young hearts and a beautiful family. We created a magical graze for Talissa and Felix for their engagement party with vegan options filled with all things natural, wild and full of love. At Sharp and Co Platters every graze is created with you in mind. Each graze is unique and made with love to ensure your grazing dreams come true. Contact us at hello@sharpandcoplatters.com so that we can create something for your special occasion. 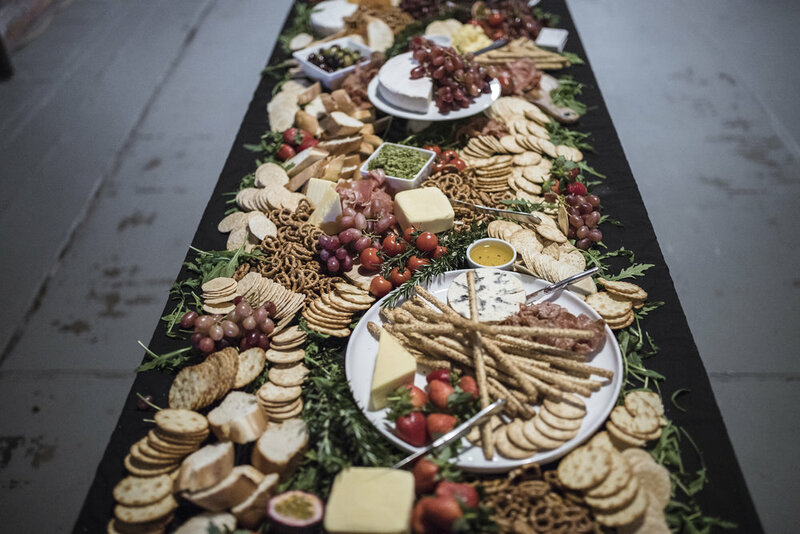 In addition to our gourmet cheese grazing tables and platter boxes we are now offering a variety of canapés, salads, meats, rolls, sweets and fruits to our platter boxes and tables to cater for all your corporate and special occasions. Please email us at hello@sharpandcoplatters.com so we can cater for you. We recently were asked to create a grazing table for a beautiful bride and groom, and their guests at the grounds of Wallalong House With the historic beauty of a thousand untold stories, but the modern luxury for a new story to unfold, this graze and wedding located on the breathtaking scenery of Wallalong along the banks of the Paterson River took our breathes away. This simple graze of artisans cheeses and accompaniments was enjoyed after the bride and groom said we do, and reminded us that being apart of people's special occasions that will forever be remembered, is why we do what we do. And that all you need is love and cheese. Please contact us at hello@sharpandcoplatters.com so that we can create a graze for you. We are now offering a selection of gourmet canapés as appetisers to add to your gourmet grazing table or that can be served separately for a fuller graze for you and your guests to enjoy. As well as a selection of freshly made and baked sweets. Contact us at hello@sharpandcoplatters.com so that we can create a grazing table for your special occasion and make your grazing dreams come true. Including Brillat Savarin Triple Cream Brie, Colston Basset Shropshire Blue and English Farmhouse Cheddar with cornichons muscatels, olives, semi sun dried tomatoes, roasted mediterrean vegetables, mezzo dips, savoury accompaniments and seasonal fruits including grapes and figs. Including smoked trout, creme fraiche and Dill + rare roast beef, horseradish cream and watercress crostinis. Including wagyu beef, proscuitto and sopressa served with artisan condiments, freshly baked bread and a side salad of rocket, pear, pomegranate and walnut salad. Including a citrus tart, rich chocolate baked brownies and butter biscuits. 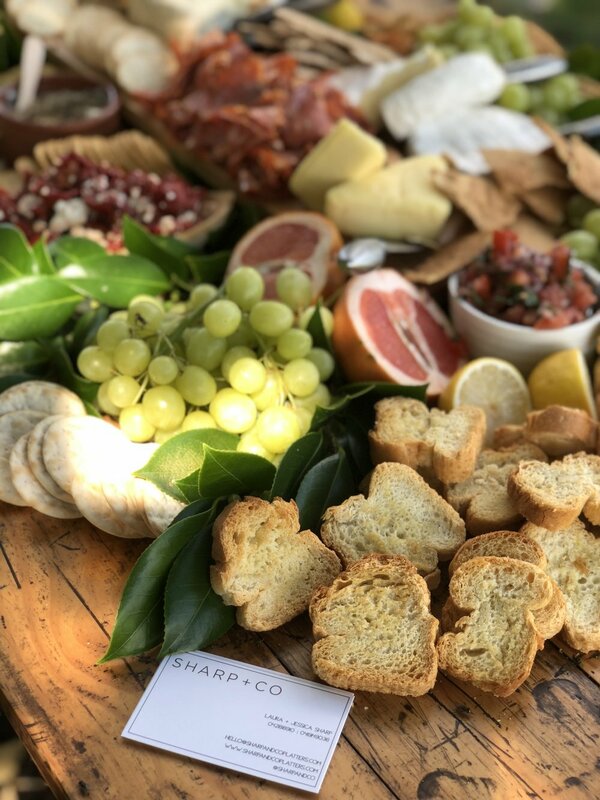 If your looking for an artisan graze for your next celebration contact us a helo@sharpandcoplatters.com so that we can arrange a gourmet grazing table for you. Tribes, women and platters matter. 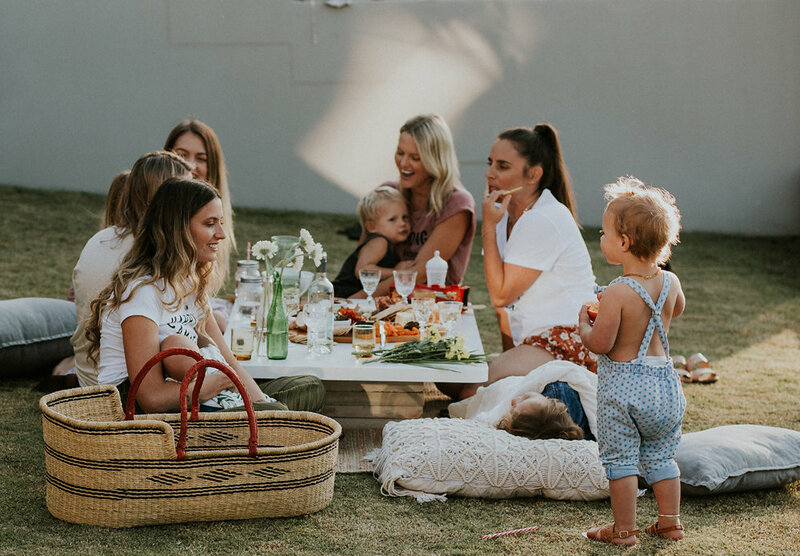 We recently created two platters for a photoshoot celebrating women, mama's and their tribe featuring Australian labels Matters Speaking, Children of the Tribe, Little Brownies, By CW, MBL Beauty and The Bee & The Fox. First up was a platter for the goddesses in the yard, and the second was a platter for their babes so that the Mamas could kick back, relax and do all the things that fills them up. To connect, eat and drink the wine of course. Is this something that you need more of in your life? Well we are your girls and can come to a back yard near you. Email us at hello@sharpandcoplatters.com and start gathering your girlfriends so that we can create something like this for you. We recently had the pleasure of providing a Sharp + Co grazing table at The Chris Michalak Event organised by Matters Speaking at Core Central. 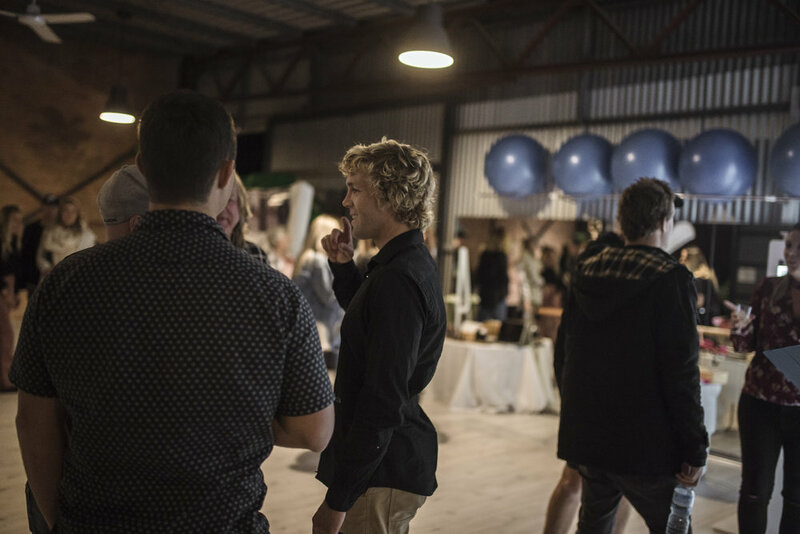 The Port Stephens community and local small businesses came together to raise over $10,000 to keep a modern day surfing fairytale and dream alive. With entertainment from Bonnie & Lachlan, The Bird Cage Photo Booth, Muse Photography, an outdoor cinema, food and beverages, the good times and donations were flowing. The night was finished off by a successful auction from Bill Knaggs Real Estate and raffles that were donated by local businesses. All proceeds went to the Chris Michalak Go Fund Me account so that Chris can continue to ride and make waves to get onto the WSL QS Series. Because it is never too late to pursue your dreams and with talent, hard work and support, anything is possible. If you are looking for gourmet grazing tables and platters for your event, big or small we are your people. Because all you need is love and good food and we love to love, and believe that there is nothing better than eating and feeding.